Do you appreciate your forty-hour, five-day workweek? Appreciate having a safe working environment? Unions made this all possible in one way or another. Unions bring value to all sectors of a society. As the champion of people power versus corporate power, unions help to spread the benefits of production throughout a society. Regardless of the state of the economy, there is the timeless struggle of workers trying to gain or retain their rights. However, a vast amount of Americans (including union members) are unaware of the full history of unions and how they have impacted the American workplace today. Unions For Beginners provides an introduction to that essential history. 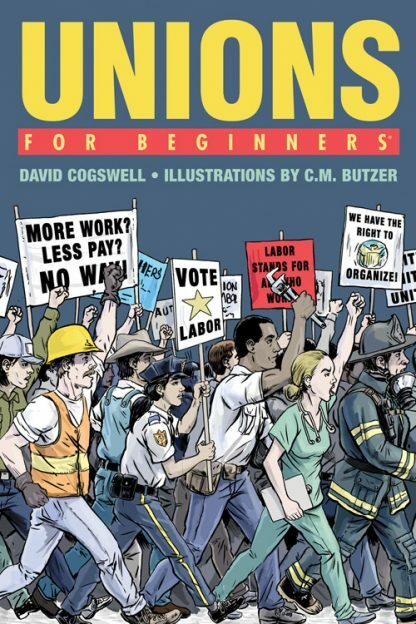 Written and illustrated in the user-friendly, accessible style of the For Beginners series, Unions For Beginners presents the epic story of the labor movement in a simple, memorable way. The role of unions in empowering working people to rise above unfair payment and work conditions to become full-fledged participants in the American dream they helped to build is told in vibrant detail. Unions For Beginners presents the history of unions and the labor movement, the principles underlying union organizing, the decline of unions in the shadow of the rising corporate state, and the resurgence in the 21st century of union activism. C.M. Butzer was born and raised in a small town in Oregon just outside of Portland. In 1992 Butzer left Oregon to attend Cornish College of the Arts in Seattle where he earned a BFA in Illustration. After school he worked for Wizards of the Coast. In 1997 he travelled all over the American West bouncing from teaching environmental education, bartending to a half dozen other things. In 1998 he moved to Florence, Italy to become a tour guide on the Italian renaissance. In Florence, he met Luigi Galante, who ran a didactic illustration studio. C.M. apprenticed for six months and was hired on as a full time illustrator. He worked for Studio Galante for nearly five years before moving to New York City to earn his MFA at the School Visual Arts. Butzer Graduated 2005 and worked since as a Cartoonist and Illustrator. In 2009 Harper Collins published his Gettysburg the graphic novel. He is currently working on his second book and working as a storyboard and concept illustrator at JWT advertising agency. His work has been featured in the Society of Illustrators, American Library Association, and the Graphic Novel Reporter.